It’s easy to make beautiful and delicious food when you begin with ingredients that are so good! I feel so lucky and grateful to know about the abundant produce and products that come out of the lovely area where we live. I feel spoiled! And what’s even cooler, these local products are available all over the country, especially Oregon Hazelnuts. Oregon provides this country with 99% of the hazelnut crop! We are lucky to have the perfect fertile ground and awesome weather that makes it ideal to grow this crop. The best part of that, they are super healthful and nutritious. As you know, I’m all about balance in life and especially food. As you also know, I eat healthfully, lots of nutrient dense foods, tons of greens, and the occasional treat. Lately I’ve been even more conscious about how much I’m eating, my servings were a bit much, which didn’t match the quality of food I eat. With such healthy foods, I really didn’t need to eat as much. So there are a few changes I’ve been making in those terms and this gorgeous salad, while I could eat the whole thing, was a perfect way to highlight quality food and smaller portions for my life. It’s easy when you have glorious foods like Oregon Hazelnuts, let us be real here. This salad was my idea of eating colorful food but would also satiate us all night, so I picked the wild rice instead of a pasta for a healthier option. Plus, I love rice :). I also chose a sprouted wild rice blend. I’m not a dietician, like I’ve said so many times, but I do know a lot about health foods. And sprouting of grains helps the absorption of the grain and nutrients into our bodies. I totally eat not sprouted rice too, but it’s probably a combination of 50/50. It tastes so good, and maybe just try it with this recipe, you’ll likely notice your tummy not having any issue digesting the sprouted grain like other grains. These nuts are a super food is so many ways. I’ve been snacking on them while I wrote this whole post. 🙂 I totally roasted extra each time I developed this recipe, and I keep roasted hazelnuts on hand for an on the go snack. They are full of fiber, manganese, folate, copper, and are heart healthy. So I also I take them hiking for a much needed replenish while I’m out on the trails. This Toasted Hazelnut Pesto Wild Rice Salad is the perfect salad for any gathering with such gorgeous color. It can be served as a side dish or a healthful and filling entree. *Toasting hazelnuts: Place oven rack in center of oven and preheat oven to 275 degrees. Place hazelnuts on a baking sheet, place in oven, and bake for about 10 minutes or until lightly golden brown. Keep an eye on them at 10 minutes, they can over roast quickly. 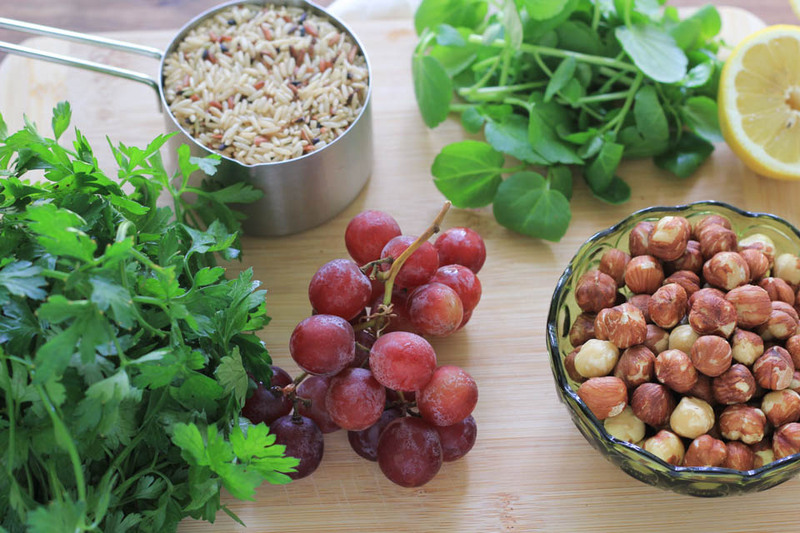 Remove hazelnuts from oven, place in a large clean kitchen towel, allow to rest for 5 minutes. Then rub hazelnuts vigorously in towel, removing the outer skin as much as possible. It’s ok if there are some that keep a little skin, there are nutrients in the skin. While hazelnuts toast, start cooking rice. 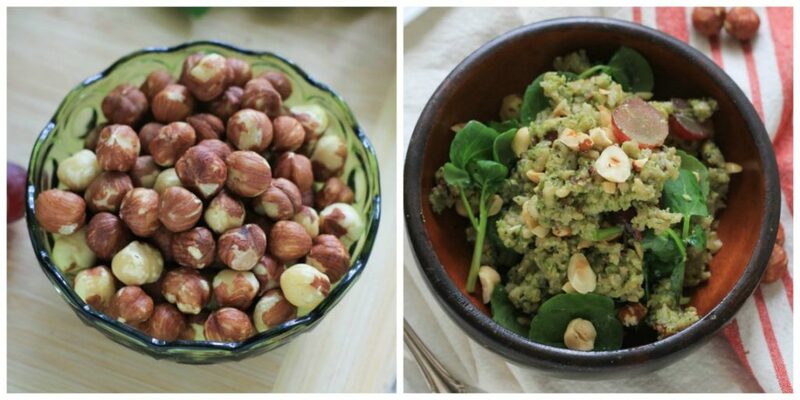 Place 1 1/2 cup toasted hazelnuts in blender or food processor, pulse/blend on high until fine crumbled. Add parsley, cheese, garlic clove, juice 1/2 lemon, and salt. Pulse/blend to combine well. 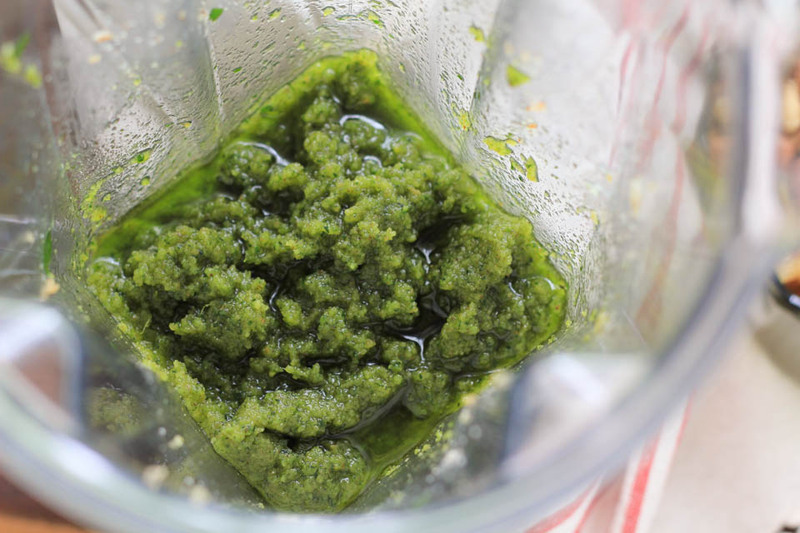 Turn on blender/processor and drizzle olive oil in a think constant drizzle to bring the pesto together. Once rice is fully cooked, remove and place in a large bowl. Add pesto to rice, and very gently combine. 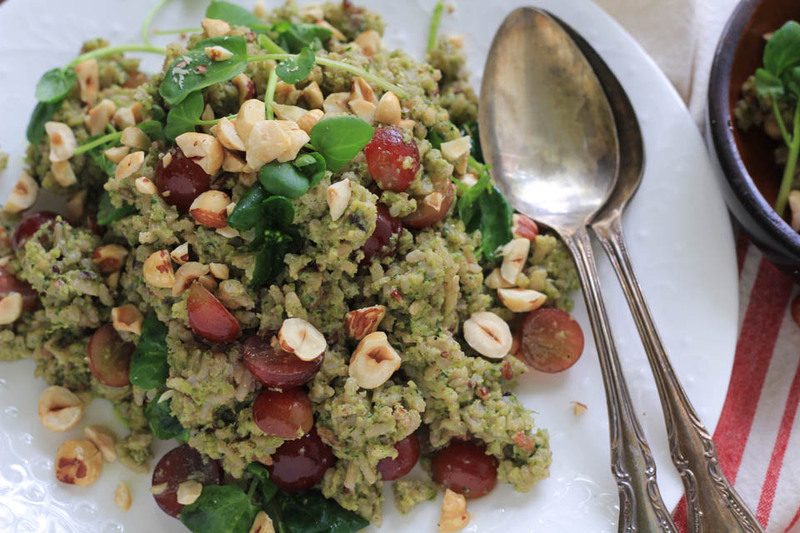 Add grape slices and watercress, fold gently into rice. To serve, squeeze the other 1/2 lemon over entire salad. Top with chopped toasted hazelnuts. Serve immediately or at room temperature within an hour. Add more watercress as a garnish if desired. Store leftovers in fridge for up to 3 days. Preferably eat leftovers cold or at room temperature. Pesto is not typically heated and does not re-heat very well. Disclosure: This is a compensated post in collaboration with Oregon Hazelnuts. As usual all opinions are my own. Thank you for supporting the brands that support NJB! This is fabulous! I’ve made pesto with hazelnuts before, but never used them in this way. So flavorful! 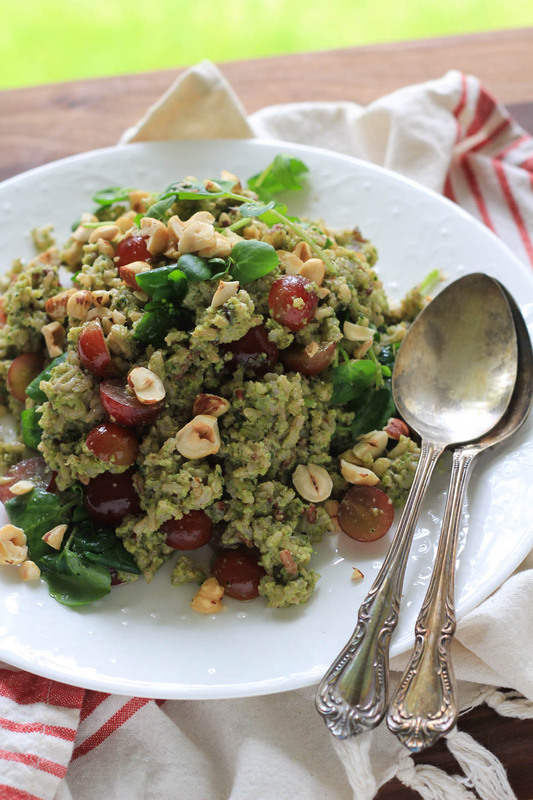 Ooooh, your hazelnut pesto sounds amazing! I just love it! Thank you. Wow, this looks amazing!! I love salads with rice as I find them more filling than a “normal” salad; I’ll have to make this after all the indulgence of Christmas! Thank you so much, exactly! WOW! That pesto looks amazing! Can’t wait to try it out! I had no idea that Oregon provided us with so many hazelnut crop! Can we just talk about how delicious this pesto sounds? Bring on the summer deliciousness. Thank you so very much, Kita! I had no idea Oregon was the hazelnut capital! Love them toasted and tossed in salads, oats and so many things for some delicious crunch! Awesome! I love that you learned that :). Oh, good call on the oats, me too! Oh, I love hazelnuts! They add such marvelous crunch and flavor to this amazing rice salad!